A Hansen grant helped with the makeover of a beauty salon/barber shop located in a long-ter m care facility. The objective was to create a functional and user-friendly space for the stylist and residents. But the real value of the project has been the creation of a social gathering space. Residents are enjoying the sunny window and cheerful atmosphere. They are gathering together and socializing which was not possible before in the cramped quarters. They showed their appreciation through a craft project. 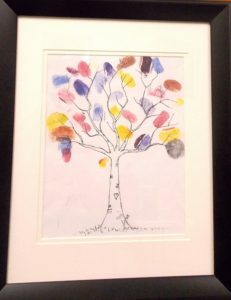 Each resident made a thumbprint in a different ink color to become “leaves” on the “Long Term Care family tree,” a print the residents gave to the stylist at the open house.